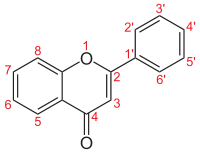 Flavones (flavus = yellow), are a class of flavonoids based on the backbone of 2-phenylchromen-4-one (2-phenyl-1-benzopyran-4-one) shown on the right. Natural flavones include apigenin (4',5,7-trihydroxyflavone), luteolin (3',4',5,7-tetrahydroxyflavone), tangeritin (4',5,6,7,8-pentamethoxyflavone), chrysin (5,7-dihydroxyflavone), 6-hydroxyflavone, baicalein (5,6,7-trihydroxyflavone), scutellarein (5,6,7,4'-tetrahydroxyflavone), and wogonin (5,7-dihydroxy-8-methoxyflavone). Synthetic flavones include diosmin, flavoxate, and 7,8-dihydroxyflavone. Flavone also refers to the flavone compound 2-phenyl-4H-chromen-4-one. Flavones are mainly found in cereals and herbs. In the West, the estimated daily intake of flavones is in the range 20–50 mg per day. In recent years, scientific and public interest in flavones has grown, but there remains insufficient evidence that flavones have any effect in the human body. As interpreted by the Linus Pauling Institute, dietary flavones, and more generally polyphenols, have little or no direct antioxidant food value following digestion. Not like controlled test tube conditions, the fate of flavones or polyphenols in vivo shows they are poorly conserved (less than 5%), with most of what is absorbed existing as metabolites modified during digestion and destined for rapid excretion. Flavones have effects on CYP (P450) activity  which are enzymes that metabolize most drugs in the body. this particular study making use of an ionic liquid solvent and microwave irradiation. This rearrangement reaction takes place in several steps: A ring opening to the diketone, B bond rotation with formation of a favorable acetylacetone-like phenyl-ketone interaction and C hydrolysis of two methoxy groups and ring closure. ↑ Cermak R, Wolffram S (October 2006). "The potential of flavonoids to influence drug metabolism and pharmacokinetics by local gastrointestinal mechanisms". Curr. Drug Metab. 7 (7): 729–44. doi:10.2174/138920006778520570. PMID 17073577. ↑ Lotito, S; Frei, B (2006). "Consumption of flavonoid-rich foods and increased plasma antioxidant capacity in humans: Cause, consequence, or epiphenomenon?". Free Radical Biology and Medicine. 41 (12): 1727–46. doi:10.1016/j.freeradbiomed.2006.04.033. PMID 17157175. ↑ David Stauth (5 March 2007). "Studies force new view on biology of flavonoids". EurekAlert! ; Adapted from a news release issued by Oregon State University. ↑ Si D, Wang Y, Zhou YH, et al. (March 2009). 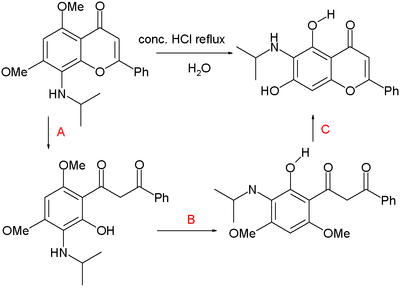 "Mechanism of CYP2C9 inhibition by flavones and flavonols". Drug Metab. Dispos. 37 (3): 629–34. doi:10.1124/dmd.108.023416. PMID 19074529. ↑ Sarda SR, Pathan MY, Paike VV, Pachmase PR, Jadhav WN, Pawar RP (2006). "A facile synthesis of flavones using recyclable ionic liquid under microwave irradiation" (PDF). Arkivoc. xvi: 43–8. doi:10.3998/ark.5550190.0007.g05. ↑ Larget R, Lockhart B, Renard P, Largeron M (April 2000). "A convenient extension of the Wessely-Moser rearrangement for the synthesis of substituted alkylaminoflavones as neuroprotective agents in vitro". Bioorg. Med. Chem. Lett. 10 (8): 835–8. doi:10.1016/S0960-894X(00)00110-4. PMID 10782697.